Coal miners in Wyoming's Powder River Basin hope Trump can help their industry. Ever since November, Stacey Moeller, a 58-year-old lifelong Democrat, feels a sense of hope when she wakes up at 3:45 each morning. The unexpected reason: Donald Trump. Moeller is a career coal miner in the Powder River Basin of Wyoming. When she works day shifts, she gets up early to make lunch (her favorite: sliced vegetables and turkey), feed her part-dachshund, Rosie, and make it to the mine with enough time to spare so she can catch up with her work friends before her shift starts. "Because of the kind of work we do — it's dangerous and it's demanding — we have to take care of each other," Moeller said as she drove to one of her 12-hour shifts last month. "Because our lives depend on it, we become a family. And that's what I love the most, is the kind of people that I've met." 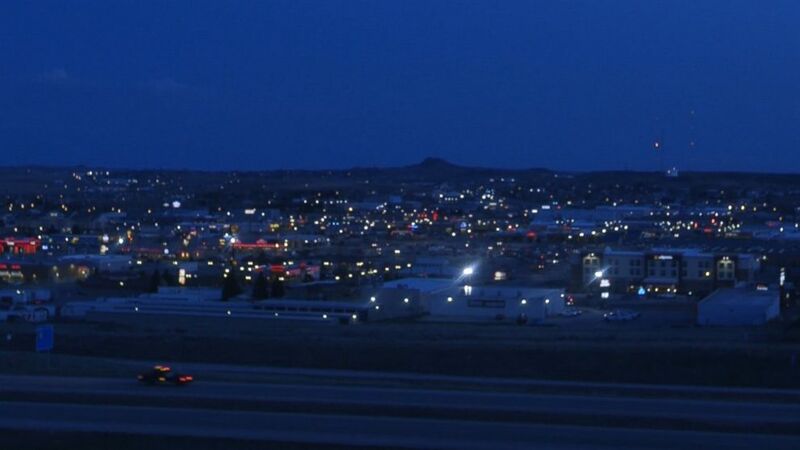 Residents said that's just the kind of place that Gillette, Wyoming, is: It's one of the largest cities in the heart of a coal-rich basin where people pride themselves on the work they do and the care they show their neighbors. There are two sayings frequently heard around this city of nearly 32,000 people. The first — said proudly by the mayor and on signs along the busiest thoroughfare — is that Gillette is "the energy capital of the nation." Any casual chat with residents here or even just a drive along Main Street quickly makes it clear that coal is king in Gillette. The most popular choice at local bakery Alla Lala Cupcakes and Sweet Things is the Double-Seam Coal Cupcake for $2.45. 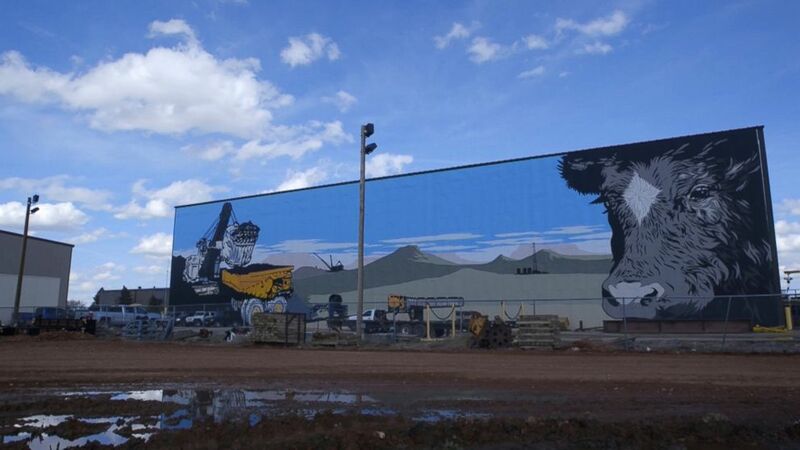 A mural along the city's busiest street depicts a bison next to a truck full of coal. Even the carpet in the mayor's office is emblazoned with the city's symbol, which looks like an atom. Just over a quarter — 26.7 percent — of Campbell County's workforce is employed by the mining, oil and gas extraction industries, according to the state's latest economic analysis division report. The second saying, seen on posters around the city, in bars and the local bowling alley, is "Stay strong, Gillette." The phrase is meant to be encouraging and to serve as a reminder of the economic downturn that hit the area so hard last year that its lowest point was dubbed Black Thursday. But more than a year after Black Thursday, residents in the town are feeling optimistic. Although the demand for coal has been on a downward trajectory for years as a result of increasing energy competition and concerns about coal's environmental impact, people in Gillette feel they have finally got a friend in the White House. 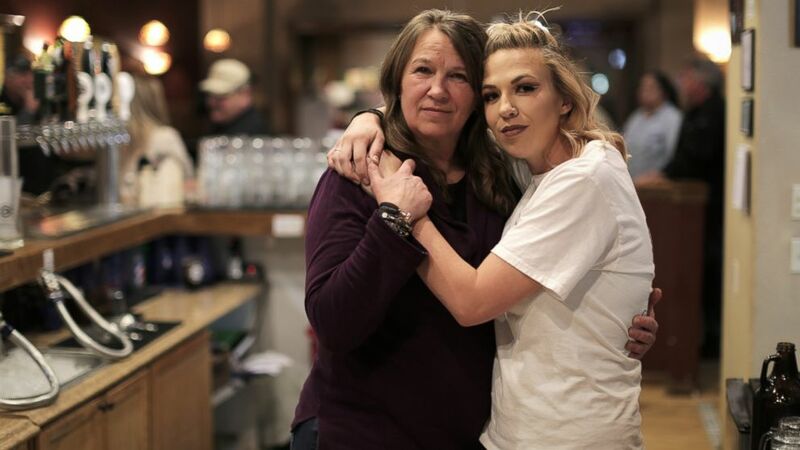 (Evan Simon/ABC News) Stacey Moeller and her daughter Kelci Luken at the Gillette Brewing Company which is owned by a local coal miner. Luken works there part time. Miners like Moeller are the new face of the industry. For most of the last century, coal mining has been portrayed in popular culture as men toiling far underground and relying on canaries for their safety. "I think most Americans do think that coal still comes from Appalachia. They have that traditional idea of the underground coal miner with the dirty face and the pickax. Coal really hasn't been mined like that in almost 50 years," said Rob Godby, the director of the Center for Energy, Economics and Public Policy at the University of Wyoming. Instead, the mining done in the Powder River Basin is what's known as surface or open-pit mining. 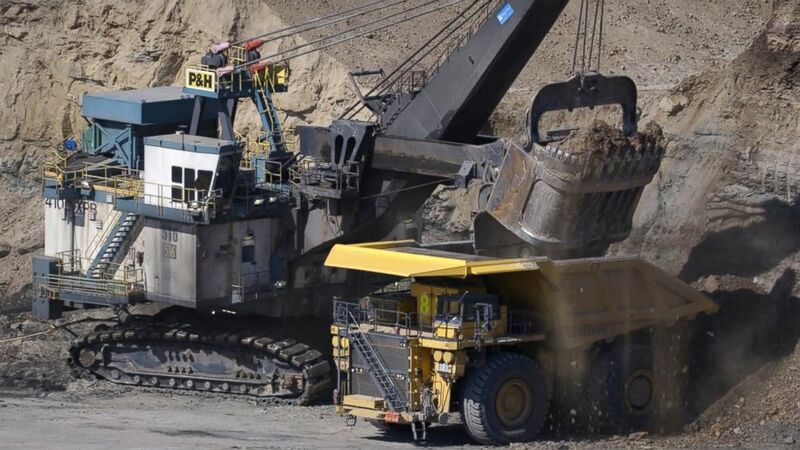 This type of mining looks like a massive sandbox in which trucks haul dirt and stones, called overburden, from one part to another as other haul trucks move the coal found directly below. The scale is far bigger than a sandbox, however. Open surface mines in Wyoming span tens of thousands of acres, and the trucks they use can sometimes be equal in size to a two-story house. (Jessica Hopper/ABC News) Surface or open-pit mining is the type of mining done in the Powder River Basin. 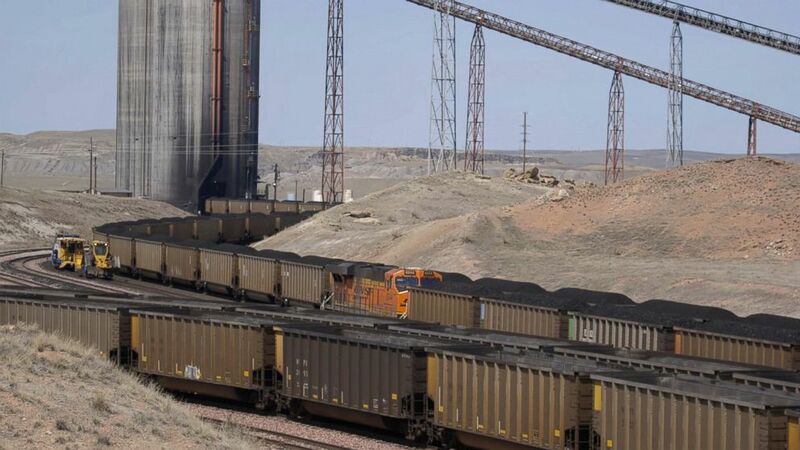 "Wyoming mines more coal than the next six states combined, and eight of the country's 10 largest coal mines are in the Powder River Basin of Wyoming," Godby said. The state's top two mines combined produce more coal than the entire state of West Virginia, Godby added. Although miners in Gillette are quick to talk about the pride they have in their work, they also feel few outside the area know the impact they make. "I would imagine someone thousands of miles from here could flip their light switch on and would have no idea it's because we work in the coal mines in Wyoming," Moeller said. She said she has worked in five Powder River Basin mines over the course of her 30-year career and currently works as a equipment operator. She's a proud Wyomingite, and although she grew up about an hour east, she has made her home in Gillette. A mother of two and grandmother of two, she has most of her family close by. Her daughter Kelci Luken and her two children live right in town, and Moeller's son is on an academic scholarship at the University of Wyoming in Laramie, about four hours south. "There's no job that I can do without a college education that paid me anywhere close to this. I raised my kids and gave them a good life," she said. "I have a couple years left, and then I'll be done." When it's time to hang up her hard hat for good, she doesn't plan to go anywhere. "I am a couple of years away from retirement," Moeller said. "When I think about that, I'll be happy to leave behind the night shifts, but I've made some great friends." The Gillette residents who spoke to ABC News said the undeniable low point of last year came at the end of March 2016, on what became known as Black Thursday. There were 465 jobs cut from two mines over 48 hours, shrinking both companies' workforces by 15 percent, according to The Gillette News Record. "In all the years that I've worked in mining, I've never seen any layoffs of full-time employees. So that was terrifying, and everything was so up in the air for our entire community and our state because we rely so heavily on coal for our tax base in Gillette and in the state of Wyoming," Moeller said. "It affected everyone. There wasn't one person in this town that wasn't affected by it," she added. "It was a devastation that I had never seen anything like." Gillette Mayor Louise Carter-King told ABC News that because the city relies on sales tax revenue and that dropped about 40 percent during the downturn, the city "had to cut our budget [by] about $60 million." (Evan Simon/ABC News) Coal mining is a major part of life in Gillette, Wyo. A local mural shows a haul truck full of coal. Certain city services were dropped, and employees were laid off. Repercussions were felt throughout the town. Families moved out of town to find work elsewhere. The local bowling league was hit hard; fewer people could afford the small luxury of a weekly night at the lanes. Nate Hardy and his wife, Dawn Hardy, own and operate the Gillette Brewing Co., a bar and restaurant housed in the old post office building in the center of town. When he is not crafting specialty brews (like the blood orange iteration on tap in April), he works in one of the local mines, and he used to work with Moeller. She is a frequent visitor because Luken works at the bar two nights a week. Although she doesn't work in the mines, she said has a close connection to the city's biggest industry through her customers. She said she remembered "hearing their stories of not knowing what they were going to do next" after Black Thursday. After last year's layoffs, Nate Hardy was able to keep his job, but Dawn Hardy said not everyone in the family was so lucky. "It was very difficult watching my sons-in-law lose their jobs and move my daughters and their families away," she told ABC News through tears. "When the news of all of the layoffs first came out, my brother, who had been at a mine for 27 years, was laid off. My nephew, who had only been there a short time, he was also laid off. My two sons-in-laws, who worked in supporting industries, were laid off and also a nephew. So we watched as they struggled trying to figure out what their next move was," she said. "I have four grandchildren, and three of them now live out of state. And that stinks as a grandmother," she added. The Black Thursday layoffs happened far from the 2016 presidential campaign trail, and neither candidate stumped in Wyoming. But the town was watching closely to see how Hillary Clinton and Donald Trump talked about coal. Just 18 days before Black Thursday, at a March 13, 2016, town hall hosted by CNN, Clinton was asked about appealing to working class voters. "We're going to put a lot of coal miners and coal companies out of business," Clinton said, before going on to explain that the people who worked in the mines should not be forgotten as the nation shifts away from fossil fuels. That sentence — but not the explanation and promises of new job incentives and investments in poor communities that followed — became a rallying cry for Trump and his supporters. "She made one remark, and whether it was taken out of context or not … That felt very personal to us, and we had enough of that," Moeller said. "I mean, we've been fighting against that for the last eight years." One thing that so many in Gillette associate with President Obama and his administration is his so-called war on coal. He never described his administration's efforts as a war on coal, but he acknowledged that some Republicans and many in coal country associated him with it. 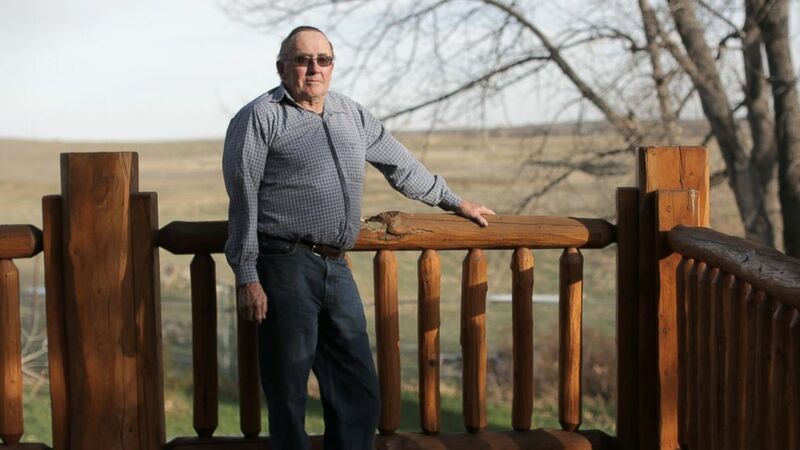 Many in Wyoming said they felt that his calls for increased attention to climate change and proposed regulation on coal-fueled power plants felt like a personal attack. 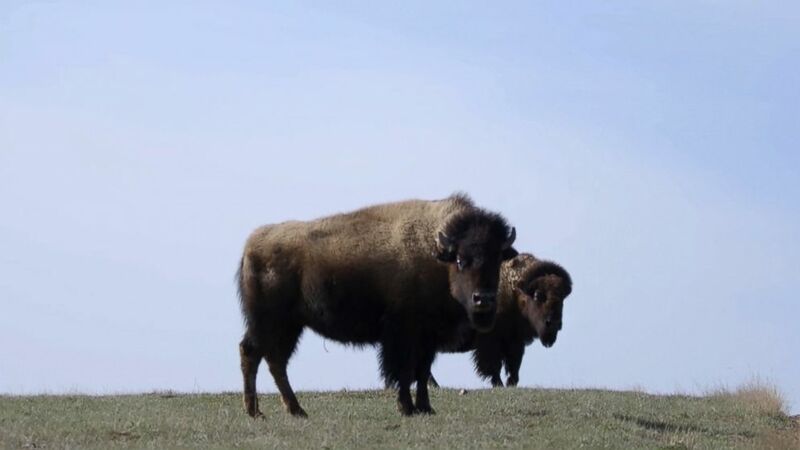 (Evan Simon/ABC News) Bison roam near Gillette, Wyo. 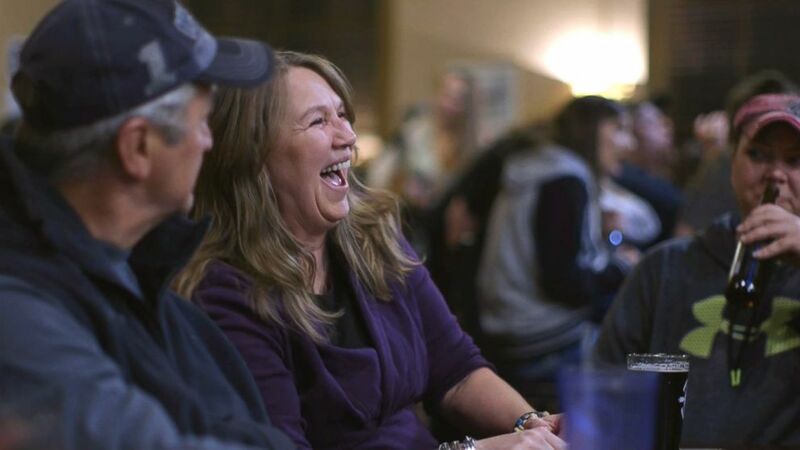 Many in Gillette felt threatened by Obama's Clean Power Plan. Proposed in 2014 but never implemented, it called for a 32 percent decrease in carbon dioxide emissions by 2030, from 2005 levels. Conversely, Trump, speaking to pro-coal audiences in Pennsylvania and West Virginia, repeatedly said that he would "end the war on coal" and put coal miners back to work. "We will be America first. We will start winning, winning, winning, and you are going to be very proud. And for those miners, get ready, because you are going to be working your asses off," he told an audience in Charleston, West Virginia, last May. At Gillette Brewing Co., Jack Laakso, a retired miner who previously worked as Moeller's boss, said he felt similarly. Laakso, who wore a vest embroidered with a "Friends of coal" logo, said things have changed since Trump took office. "We went from a down time last year, where we had a president and a presidential candidate who said they were going to shut down coal mining … to having a candidate that says, "Hey, I'm here with you. I'm here for you. We're going to do something,'" Laakso said. He said it's too soon to tell whether Trump keeps his promises but that people in Gillette are hopeful. "You saw right after the election, you walk downtown, you saw people with smiles on their faces. They finally felt like the albatross was gone, that there's been 200 pounds lifted off their shoulders," he added. "We still have to take the wait-and-see approach to see if all that comes to fruition, but all of a sudden, coal mines are hiring, some of the ancillary jobs that were gone are coming back — so there's hope," Laakso said. (Evan Simon/ABC News) In surface mining, trucks haul dirt and stones, called overburden, from one part to another as other haul trucks move the coal found directly below. There wasn't much hope on the night of the election, however, according to Carter-King. The town was preparing for a Clinton win, and Carter-King said she even wrote a speech to try to reassure people things would be OK for an all-hands meeting scheduled for the next day. "Really, it would have been the final nail in the coffin, just because she had said she wanted to put coal miners out of work," Carter-King said of Clinton. But she said that as she was "watching the returns in the office and as they kept coming in for Trump, I finally said, 'Throw that speech away. We're good!'" Carter-King, who had the town's atomesque symbol embroidered on her blazer lapel on the day she spoke with ABC News, said that relief could be felt throughout the city. "It was true — just going into a restaurant the next day, the attitude and the atmosphere in the town was just electric. People were just so happy, the restaurants were full, and everybody was just really upbeat," she said. "I think that optimism is still here today." While Gillette breathed a sigh of relief after Trump's election, experts said Trump's actions thus far have not brought much relief to the coal industry. "So far, the Trump administration hasn't been able to do a lot," said Godby of the University of Wyoming. He noted that so far, Trump and his administration have been able to reverse some of the Obama-era executive orders that affected coal, but Godby doesn't expect them to prompt massive, immediate change. One such move was to reverse a moratorium that Obama put on leasing federal lands for coal mining. But Godby said that doesn't address the fact that the number of coal customers has dropped in recent years. He added that some of Trump's actions have helped coal's main competitor, natural gas, making the direct benefits to the coal industry unclear. "Some of the changes or reversals of orders help coal, but others helped natural gas, and so it's unclear just how that will balance out in the market, whether it will give the advantage to gas or coal," Godby said. (Evan Simon/ABC News) According to a local economics professor, Wyoming’s top two mines produce more coal than the entire state of West Virginia. He said that the Trump administration could take particular actions to help the coal industry by subsidizing coal with a tax credit or rebate, for instance, but the biggest uncertainty for coal will be greenhouse gas regulation in the future. "We're still part of the Paris Agreement, for example, and even if the Trump administration reverses that and removes us from that treaty agreement, the Trump administration, at most, will only be in office for eight years, and that could change in the future," Godby said. There has been speculation in recent weeks that Trump may make good on his campaign promise to renegotiate or withdraw from the Paris Agreement, a deal reached among more than 190 countries to lower carbon emissions and shift toward renewable energy in the coming decade. Richard Reavey, the vice president of public affairs at Cloud Peak Energy, said that from its perspective, social concern over climate change is not going to go away in the near future, so the coal industry needs to have the leeway to adapt and figure out a way to stay in the picture. "Two-thirds of Americans believe [climate change is] real, and they believe CO2 plays a role in that. So as far as we're concerned — regardless of the science, and certainly the time for debating science is over — it's a socioeconomic reality and one that has to be dealt with," he told ABC News. Outside Wyoming, much of the concern and consternation about coal stems from the its impact on the environment. But many of those who live in the state, the nation's least populous, appear to feel that much of the criticism of coal is unfounded or is already being addressed by companies. Some miners and Gillette residents who spoke to ABC News acknowledged that they think climate change is real but believe that coal has become an scapegoat. As Christi Johnson, a 44-year-old haul truck operator at Cloud Peak's Antelope mine, put it, "It's easier to blame it on coal." Laakso said that for every article he reads about climate change, there's another article that disproves those claims. However, there is broad consensus in the scientific community that climate change is happening and is caused by man-made factors. In that context, coal is seen as one of the least efficient energy sources and one of the biggest offenders. One miner told ABC News he feels that coal is being overregulated to the point that the industry isn't given the chance to make it more efficient and environmentally friendly, and several other people, including Moeller, point to the coal industry's efforts to lessen its environmental footprint. Mining companies are legally required to put the soil and earth that they moved to extract coal back in place after they finish mining in a particular area. In that process, reclamation, it is mandated that the land be left in a condition equal to or better than before the mining — leading many people in the industry to see it as essentially cleaning up their own mess. "We are stewards of our lands here, and we take pride in that," Moeller said. "It's something that matters to us not only because we have to. We want to. We love this land," she added. But coal mining's impact on the environment isn't always a positive one. "For a long time, coal has been the main contributor to the emissions of CO2," said Pieter Tans, the lead scientist of the Global Greenhouse Gas Reference Network of the National Oceanic and Atmospheric Administration in Boulder, Colorado. Additionally, coal, oil and natural gas produce different levels of emissions. Coal accounts for 42 percent of global emissions, but the International Energy Agency reports that it accounts for less than 29 percent of the world's energy supply. In the U.S., coal is responsible for 29 percent of carbon dioxide emissions but provides only 17 percent of the country's energy, said Tans. "Coal is not as efficient in giving us energy per carbon emitted," he said. Several people ABC News spoke to who work in coal mines pointed to carbon capture research as something that energy companies are doing to help improve their carbon footprint. In carbon capture, carbon dioxide is collected at sources like fossil fuel plants and is prevented from being emitted into the atmosphere, and many additionally hope to repurposed the excess CO2 in some way that could be profitable, potentially motivating plant operators and others to discharge less carbon into the atmosphere. There is a $20 million competition sponsored by the X Prize Foundation, a nonprofit group that encourages technological development, to develop a carbon capture program that could be used by coal-fired power plants. "I believe in five years or so, we could be the energy research capital of the nation, because we have everything here that we can research — climate change, how to develop better-burning coal," Carter-King said. "That's what our goal is." That goal, however, could be at least a decade out from becoming a reality. Dry Fork station, a coal-fueled power plant nearly 10 miles north of Gillette, is building a carbon capture testing facility, but at the moment it's an empty lot. The plant engineer, Dennis Thorfinnson, told ABC News that it will probably take the next decade or two "to perfect such things." Tans told ABC News that it's "still speculative at this point how successful [carbon capture] can be. We have not really tested this at scale." "It will take maybe 20 years before we're really ready to do this. In the meantime, wind and solar will continue to get cheaper," he added. "So I don't know if in 20 years we may just say we should have just skipped coal and gone to renewables right away." Beyond environmental concerns, coal companies are also facing threats from economic competition from oil and natural gas. (Evan Simon/ABC News) Mining companies are legally required to put the soil and earth that they moved to extract coal back in place after they finish mining in a particular area, and often point to how animals return to the land to graze as proof of the success of that process. Godby said that coal production continued to climb until 2008, when the recession led to less demand for energy as a result of cost cutting. Also, the country saw a boom in hydraulic fracturing, also known as fracking, to extract more natural gas. "The natural gas market began to flood, and prices began to plummet. And natural gas and coal compete with one another in the production of electricity, and that decline in natural gas prices displaced coal and electricity production," he explained. Godby added that since 2008, the demand for electricity hasn't noticeably grown and natural gas has become cheaper. This has led coal as an electricity source to fall from about 50 percent to 30 percent of the energy market over the past eight years, he said. Members of L.J. Turner's family have owned their ranch for nearly a century. 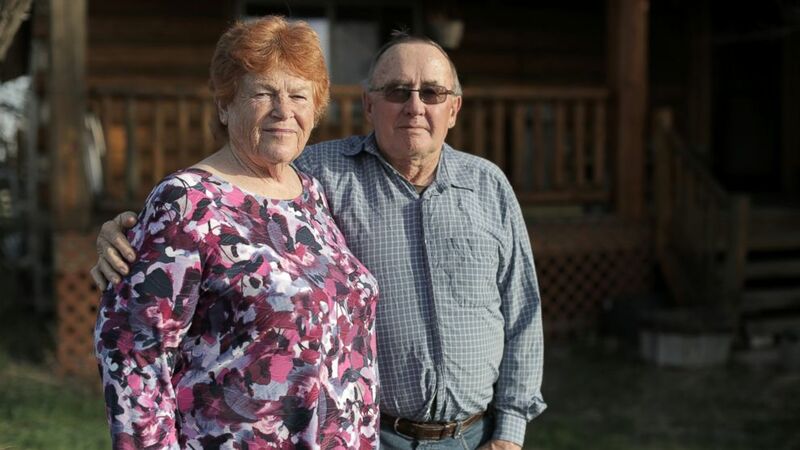 He and his wife, Karen Turner, are two of what they described as the not many Democrats who live in Campbell County. They said the negative experiences they've had with the coal industry in the area have put them at odds with many of their neighbors. (Evan Simon/ABC News) Karen and L.J. Turner say that they are two of only a few Democrats in the area. The Turners raise Red Angus cows and Targhee sheep on their 10,000 acres. Their animals used to have much more land to roam, but the Turners said they have seen their livestock grazing leases diminish as federal priorities have shifted elsewhere. "The thing is that the government can get way more money leasing the land to a coal company then they can for livestock grazing leases," said Karen Turner, 70. And the land they do have to graze their animals on has become increasingly contaminated, they said. The couple said that a number of their calves came down with dust pneumonia when they were allowed into some of the plots of land closer to the mines, where explosives are used to break up the coal so it can be carted away. 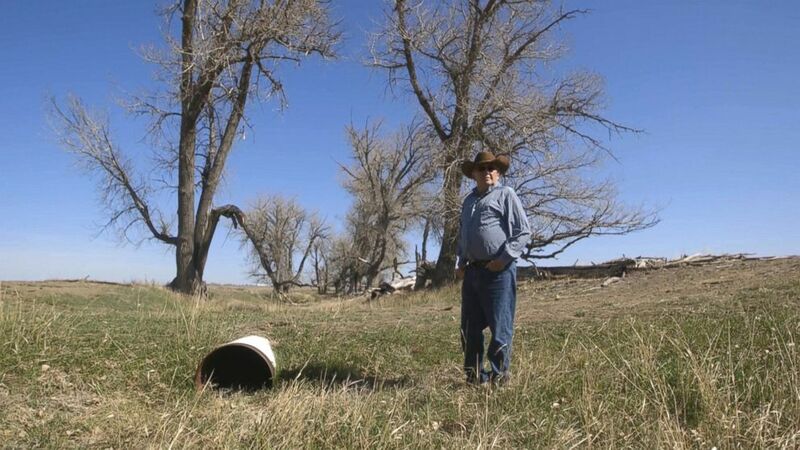 A creek and some springs that used to be plentiful on their property have completely dried up because, the Turners said, one of the mines cut the aquifer that supplied the water. "The water situation is probably the one thing that just made the biggest difference on us, because even the forage along the creek here suffers from the water being drained out," said L.J. Turner, 76. ABC News reached out to Peabody Energy, a mining company that owns one of the mines close to the Turner's property, and its spokeswoman Charlene Murdock declined to directly address the Turners' claims but gave a statement. "Peabody's North Antelope Rochelle Mine maintains a strong record of environmental stewardship, and our monitoring shows standards to protect air and water quality are being achieved. 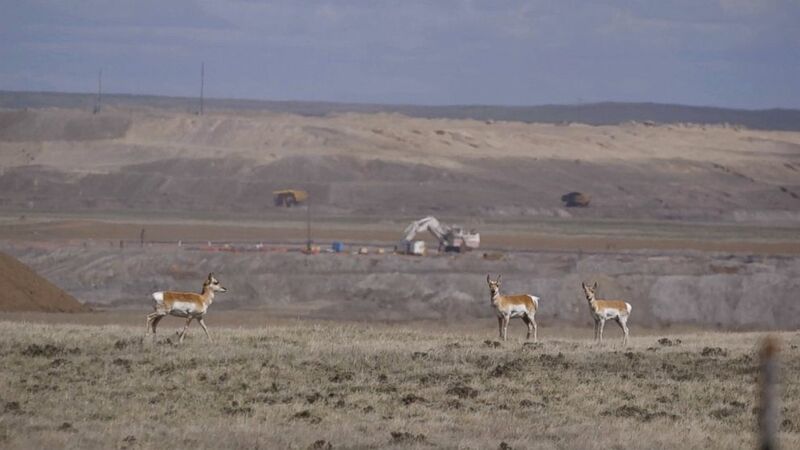 Peabody works in partnership with neighboring landowners who successfully graze their livestock on the ample forage of reclaimed mine lands," she told ABC News. "In 2016, Peabody's successful land stewardship achieved 1.8 acres of reclamation for every acre disturbed in mining activities. Over the past decade, Peabody has spent $185 million to restore approximately 48,000 acres of land. Our restoration efforts have been marked by 90 environmental honors since 2000," the statement said. (Evan Simon/ABC News) L.J. Turner’s family has had their ranch in Gillette for nearly a century. He is one of the few vocal critics in the area who take issue with the impact that coal mining has on the local environment. 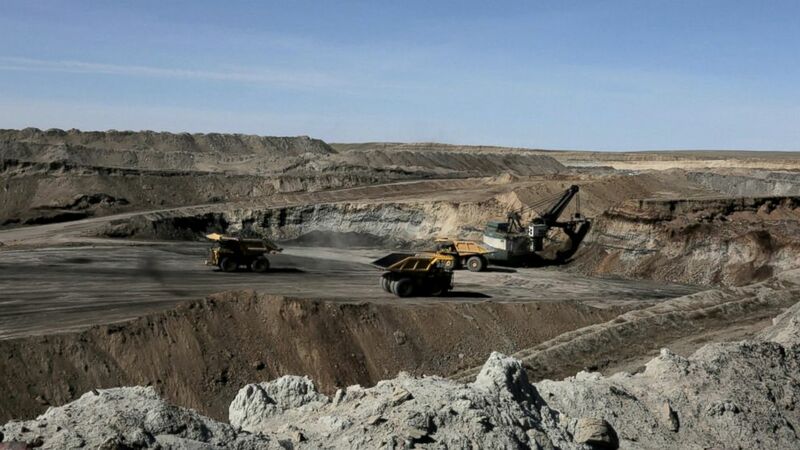 Surface coal mining has a history of depleting groundwater in the Powder River Basin, according to the U.S. Geological Survey, the University of Wyoming and others. Of the dozens of people ABC News reporters met in Wyoming while reporting this story, Karen Turner was the only one to call for a nearly immediate closure of the mines — an idea supported by many scientists outside the region. "It would be a disaster," L.J. Turner said. "The coal needs to gradually get phased out while the renewables build up," she acknowledged. "I don't dislike coal miners. I dislike coal," she clarified. "There's a big distinction, in my mind anyway. I mean, I don't begrudge people wanting a job, you know. I just think they need to see the writing on the wall and they need to think, 'OK, this is not going well, maybe I should figure out something else.'" (Evan Simon/ABC News) L.J. Turner claims that the local coal mines cut the aquifer that provided water to his land, and now the creek on his property has dried up. When Moeller gets home from a 12-hour shift, she evaluates her day based on how quickly it seemed to go by. Then she greets her dog and freshens the water bowl before settling in to talk to her daughter, Kelci Luken. "If I don't call Kelci within 10 minutes of getting home, she presumes I've been killed in a car accident on the way home," Moeller said. "My daughter is forever checking on me." Moeller said that even though she plans to retire soon, she will always consider herself a miner. Like many others in Gillette, the pride she takes in her work doesn’t end when she clocks out. (Evan Simon/ABC News) A number of coal miners, including Stacey Moeller, voted for President Donald Trump because of his promises to bring back coal jobs. Moeller said that they’ve seen “a lot of ups and downs in Gillette” but right now they feel like they’re on the upswing.